VANCOUVER — There were two songs stuck in the heads of Team Canada players when they woke up on Thursday morning. Their new goal song — Pitbull’s ‘Don’t Stop The Party’ — that blared no fewer than 15 times during Wednesday’s tournament-opening 14-0 demolition of Denmark. After each and every goal, then once more for good measure following the final buzzer. And their national anthem, O Canada, which played twice on Boxing Day to begin the 2019 IIHF World Junior Championship. Once with lyrics prior to puck-drop as part of the opening ceremonies and again to end the night — the latter without lyrics, as is customary for the winning team. That is the version of the song they are hoping to hear on repeat through the gold-medal game on Jan. 5. “The O Canada gave me chills at the beginning,” said Jaret Anderson-Dolan, a forward from Calgary and co-captain for the WHL’s Spokane Chiefs — citing the anthem as his lasting memory. “That was unbelievable, it’s something we’ve all watched on Boxing Day since we were kids and to be a part of it is pretty special. “That’s just something that you dream of — to be out there representing your country and especially on home soil with a crowd like that. It was amazing,” added the Los Angeles Kings prospect. Team Canada was amazing too, attacking in waves from start to finish and overwhelming the Danes in every facet of the game. As a result, Pitbull got plenty of play, but nobody inside Canada’s dressing room was ready to stop the party ahead of facing Switzerland in their second round-robin game today (5 p.m. PT, TSN). Some on social media were pleading ‘please, no more Pitbull’ but the players were doing everything in their power to keep the goal song on loop last night — and certainly into today. Owen Tippett did his part by scoring twice — making it 2-0 in the first period and 7-0 in the second — and he, for one, wasn’t tired of hearing Pitbull. Canada is coming off a night of firsts. Morgan Frost netted the first hat-trick of his junior career — he’s produced 14 two-goal games with the OHL’s Sault Ste. Marie Greyhounds — and Cody Glass recorded his first four-assist performance, having yet to accomplish that feat through 227 games with the Portland Winterhawks as one of the WHL’s premier playmakers. Frost is leading the tournament in scoring through the first day with five points, while Glass is tied for second with four points, along with captain Max Comtois, who tied a Team Canada record with four goals, and fellow teammate Brett Leason, who bagged two goals and two assists in the blowout. Frost, who opened the scoring to reveal their top-secret goal song before making it 3-0 and 5-0, was named Canada’s player of the game and serenaded with chants of Frosty! Frosty! from the 16,417 partisan fans at Rogers Arena. The other criticism on social media — besides too much Pitbull — was in regards to Canada running up the score and embarrassing Denmark to some degree. It’s true, a two-touchdown margin is tough to swallow for the Danes, but Canada couldn’t ease up or back off. That thought never crossed the mind of coach Tim Hunter or the players through two-plus periods, though Canada seemed to stop pressing in the dying minutes to protect DiPietro’s shutout. 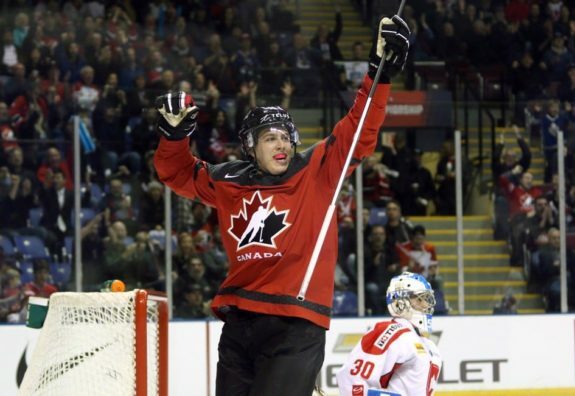 Team Canada captain Max Comtois scored three of his four goals in the third period during Wednesday’s 14-0 win over Denmark in Vancouver. Some complaints were aimed at Hunter’s decision to send out Canada’s top power-play unit to start the third period despite already leading 8-0. But even that was justified by Anderson-Dolan, an assistant captain who scored the 8-0 goal in the final minute of the second period prior to Denmark taking a late penalty that carried over. “Tonight was kind of out of hand, but obviously not all the games are going to be like that,” he said afterwards. “So putting our power play on at the end there, that’s just to keep them sharp and give them reps because we haven’t been together a lot. I think any reps, especially in a game with the pressure on, is good for them. More of the same would be welcomed today against Switzerland, but most are anticipating a closer outcome. Switzerland enters as a heavy underdog despite taking the Czech Republic to overtime in a 2-1 defeat to start their tournament on Wednesday. The Swiss also played Canada tough in a pre-tournament game, falling 5-3 with an empty-net goal the previous Wednesday. Canada wasn’t nearly as sharp in that exhibition contest and while the Swiss appear more formidable than Denmark, Frost and company could produce another lopsided victory by picking up where they left off. Many fans are already looking ahead to New Year’s Eve when Canada will clash with Russia on Monday in a potential first-place showdown to finish atop the Group A standings. The payers, though, are staying in the moment.